The cast of ‘South Pacific.’ Photo provided by Annapolis Opera. 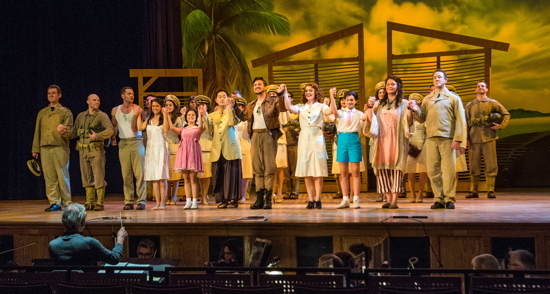 Rodgers and Hammerstein II’s musical take on James Michner’s “Tales of the South Pacific,” with a book by James Logan and Hammerstein, “South Pacific” has been produced constantly since its premier in 1949. The Annapolis Opera dives head first into those heady waves with their production that ran (sadly) for only one weekend at the Maryland Hall for the Creative Arts. The tale of Nurse Nellie Forbush and her relationship with island plantation owner Emile De Becque during the World War II, the story was made poignant on the final day of performance due to the presence of Ms. Lucy Flade Libby, a 95 year old veteran of WWII who actually served in the South Pacific as a nurse. Sunday, November 6th, 2016 was proclaimed Lucy Libby Day by the mayor of Annapolis. …filled with fabulous performances from this fantastic company. Stage Director Braxton Peters skillfully guided the performance through April Joy Vester’s delightfully minimalist set design and Michael Klima’s evocative lighting designs. With four bamboo-inspired flats and a handful of set pieces serving in turn as an outdoor dining room, a hokey stage for a company talent show, a war room and, of course, the beach – and a beautiful backdrop calling to mind the serene waters of the Pacific Ocean – the production looked entirely fitted to the space. An unexpected joy was the costuming by Elizabeth D’Antonio and her crew. Of particular note were the period-perfect bathing suits worn by the nurses, and the shabby comic outfit sported by Bloody Mary. Conductor Ronald J. Gretz led the Annapolis Symphony with grace and drive. With nary a false note, the accompaniment to the familiar music was fully up to its task. While a couple of the songs might have been a tad bit livelier, there was nothing to disappoint the ear of the most discerning music critic. The acoustics of the spacious hall were outstanding, thanks to last spring’s renovations. When you go to see an opera company perform an iconic Broadway musical, you expect to hear voices a cut or three above most stage vocalists. The Annapolis Opera delivers that in spades. The chorus was filled with so much talent it’s a wonder it didn’t splash off the stage. De Beque’s adorable children, the rough and tumble seebees, the lively nurses and the officers all were great support to the main characters. James Ludlum provided comic relief and great timing as the company’s scheming con man, Luther Billis. While a bit shy on stature he managed to fill the stage and steal the show in scene after scene. His voice is wonderful to listen to and it made me wish the character had more to sing. Kate Jackman as Bloody Mary was definitely Luther’s equal in the scheme department, and her mezzo-soprano voice dipped low and soared high in her highly successful rendition of ‘Bali Hai’. She performed well physically, with a hip thrust or foot stomp for emphasis, all with a sly grin heralding a lovely voice. Glenn Seven Allen possesses one of the best tenor voices I’ve ever heard sing the part of Lt. Joseph Cable. He’s also a fine actor with great timing. And the six-pack abs took nothing away from his stellar tenor vocals. When he sings “Younger Than Springtime” he is visually and musically riveting. Christian Bowers played Emile De Becque. If Clark Gable could sing and had a French accent, he’d have been Mr. Bowers. With an outstanding command of the stage, he is forceful and concentrated. His laser focus on his character comes through in every scene. With a voice that seemingly has no bottom notes too low, he can go from a purr to a growl and make every nuanced note believable and heartfelt. As Nellie Forbush, Nora Graham-Smith was an absolute joy. While she never let you forget that she is an opera singer, she was as skilled as any Broadway leading lady could hope to be. Adroitly flipping from her head voice to chest voice, she could belt with the best of them, hit the high notes with ease becoming the mezzo-soprano vocalist she’s made a name on, breathe a sigh into a phrase that left a catch in your heart and a tear on your cheek, then make you giggle at her shameless mugging. An absolute pro with a bravura talent. The Annapolis Opera is one of the gems of the Mid-Atlantic. How wonderful that they chose to share this particular production at a time when we could all use a little escape into a “South Pacific” filled with fabulous performances from this fantastic company. For more information on upcoming productions from The Annapolis Opera, click here. Timoth David Copney has decades of experience in theatre. A classically trained dancer, he is a veteran of several Equity tours, a Canadian television series, and has worked on more than 40 productions in the Baltimore area as a dancer, director, choreographer, singer, and actor. He is the former theatre columnist for Baltimore Gay Life Magazine and the former Vice President of the Baltimore Theatre Alliance, and was the Artistic Director of Liberty Showcase Theatre. He currently is a member of the board of directors of the Baltimore Playwrights Festival.